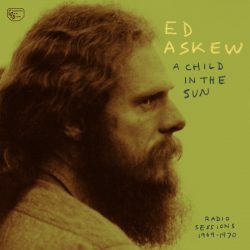 The energy which oozes from this collection of early recordings retrieved from the archives of old Ed Askew radio sessions provides a strong urge to delete the pesky mp3 and rush out and buy the vinyl version. That’s how this album should be heard if truth be told. But even played via digital format the scratchy crackle of analogue reel to reel feels wonderfully raw while Askew’s Martin Tiple ukulele and nasal growl provides music to match the exposed production. There are stripped back versions of many tracks from the Ask The Unicorn era as well as spoken interludes of Ed in his hippy heyday explaining how production tricks were minimised in order to capture the essence of the music and other such pearls of wisdom. Askew classics including Fancy That, Mr Dream and Accordion Man are all here along with one previously unreleased track. For fans of the painter and space-folk connoisseur this assortment of long-lost recordings will be a delight and for any of those Woodstock breed of folksters out there for whom Askew has passed by in a haze of green smoke, well this is a perfect opportunity to get acquainted.